Beth entered the education profession as a middle school science teacher who wanted to make a difference in the lives of her students. After teaching for a number of years, she wanted to accomplish more than the work that she could do within her classroom and, thus, became a grade-level chair. Beth also worked on the district's science curriculum committee, and then began taking classes at the university at night to earn her administrative and supervision license. Beth was an outstanding teacher, and her first administrative position as the assistant principal for instruction seemed tailor-made for her strengths. Her instructional expertise and knowledge of curriculum provided her with a sound foundation for leading instructional efforts in her school. Beth's office walls looked like a strategic command center of data disaggregation and data tracking. She traveled through classrooms daily, observing instruction and student learning. Her observations helped her to identify classroom needs and strengths. She collaborated regularly with grade-level teams to monitor the needs of students and to determine strategies and resources that could better support students and teachers. And she continued to meet with students to talk about their education goals and progress. In essence, Beth is committed to make teaching and learning in her school the most positive experience it can be. One major emphasis in the educational arena in the early 21st century has been the continuing demand for greater accountability to increase student performance. National and state expectations require schools to ensure that all students achieve mastery of curriculum objectives, and local schools focus on implementing those requirements to the best of their ability. As a result, leading instructional efforts in a school has evolved into a primary role for school principals. Figure 1.1 outlines key references relating to these elements of instructional leadership. If you are not sure of where you want to go, how will you ever get there? Furthermore, how will you know when and how to take corrective action along the way? And how will you know when you've arrived at the destination? A successful principal must have a clear vision that shows how all components of a school will operate at some point in the future. Having a clear image of their schools helps principals avoid becoming consumed by the administrative requirements of their jobs. In fact, principals may need two types of vision: one vision of their schools and the roles they play in those schools, and another vision of how the change process will proceed (Manasse, 1985). Clearly, multiple role expectations exist for school leaders. All schools need principals to exercise their roles as instructional leaders who ensure the quality of instruction (Portin et al., 2003). Thus, there is a need to spend time in classrooms observing the process of teaching and learning while also balancing other needs such as student safety and parent relationships. Fulfilling these multiple responsibilities well requires principals to possess an inner compass that consistently points them toward the future interests of the school, never losing sight of their schools' visions, missions, and goals. Successful principals understand that it is important to establish clear learning goals and garner schoolwide—and even communitywide—commitment to these goals. The development of a clear vision and goals for learning is emphasized by principals of high-achieving schools (Leithwood & Riehl, 2003). They hold high expectations that teachers and students will meet these goals and hold themselves accountable for the success of the school. These principals provide emotional support for teachers and are viewed as possessing the ability to foster positive interpersonal relationships. They protect instructional time by limiting loudspeaker announcements and scheduling building maintenance to minimize disruptions. They ensure that student progress is monitored through the continual aggregation and disaggregation of student performance data that are directly related to the school's mission and goals. Principals of high-achieving schools are confident that they will accomplish their vision and goals despite challenges and setbacks and, thus, serve as role models for staff and students (Cotton, 2003). And when milestone achievements are reached, those successful results are celebrated. First and foremost, principals need to have a clear vision for their schools (Manasse, 1985; Zmuda, Kuklis, & Kline, 2004). 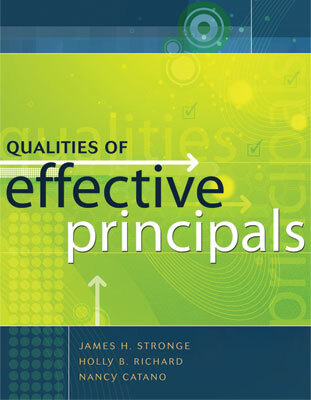 Schools need principals who strive to ensure the quality of instruction in their schools (Harris, 2007; Marzano et al., 2005; Portin et al., 2003). Principals of high-achieving schools expect teachers and students to meet the schools' goals (Leithwood & Riehl, 2003). Principals of high-achieving schools are confident that their schools can meet their goals (Cotton, 2003). Principals who focus on school improvement have more effective schools (Shen & Hsieh, 1999). Principals of high-achieving schools communicate to all stakeholders that learning is the school's most important mission (Cotton, 2003; Marzano et al., 2005). Guiding a school staff to reach a common vision requires intensive and sustained collaboration. After all, it is the expertise of teachers upon which any quality educational system is built. Wise principals know that going it alone makes meeting instructional goals virtually impossible. A key responsibility of school leaders is to sustain learning, and this can best be accomplished through leading learning endeavors that are focused on long-term outcomes rather than short-term returns. Additionally, distributing leadership throughout a school and providing for leadership succession are indispensable to a school's success (Hargreaves & Fink, 2003). "Leaders influence others to understand and agree about what needs to be done and how. This process requires the facilitation of individual and shared efforts to accomplish common objectives" (Kyrtheotis & Pashiardis, 1998b, p. 3). There is no evidence of troubled schools turning around without the influence of strong leadership. Effective leadership sets the direction and influences members of the organization to work together toward meeting organizational goals. Principals can accomplish this essential responsibility by providing individual support, challenging teachers to examine their own practices, and securing models of best practice. Additionally, effective principals develop and depend on leadership contributions from a variety of stakeholders, including teachers and parents (Leithwood et al., 2004). As key instructional leaders, principals share their leadership with teachers to promote reflection and collaborative investigation to improve teaching and learning. Subsequently, teacher leaders lead change from the classroom by asking questions related to school improvement, and they feel empowered to help find the answer (Reason & Reason, 2007). In practical terms, principals talk to teachers, provide staff development, and support lifelong learning about teaching and learning (Blase & Blase, 1999). They also create opportunities for teachers to work together and share teaching practices with one another. What they tend not to do, however, is to exhibit directive leadership styles (Mendel, Watson, & MacGregor, 2002). Consequently, principals are not the only instructional leaders in a school. In sharing leadership, principals collaborate with teachers to evaluate issues related to curriculum, instruction, and assessment. As part of this collaborative process, teacher leaders provide valuable insight and ideas to principals as they work together toward school improvement. Principals who tap into the expertise of teachers throughout the process of transforming their schools and increasing the focus on learning are more successful. And a valuable byproduct for principals who collaboratively focus on instructional leadership is that they are less likely to burn out (Marks & Printy, 2003). Interestingly, some evidence suggests that female elementary school principals participate more actively in instructional leadership than their male counterparts. Also, they spend more years in the classroom before entering their first administrative post and, consequently, may possess greater knowledge in instructional matters (Cotton, 2003; Hallinger, Bickman, & Davis, 1996). Perhaps most telling is the suggestion that because female administrators tend to assume a major instructional role as central to their work, they shape teachers' attitudes regarding students' ability to master subject matter, thus, having an indirect effect on student outcomes through their teachers (Cotton, 2003; Hallinger et al., 1996; Hallinger & Heck, 1996). Wise principals understand that they cannot reach instructional goals alone (Hargreaves & Fink, 2003). Attaining school goals requires individual and shared efforts (Kyrtheotis & Pashiardis, 1998b). Effective instructional leaders believe that staff should collaborate and openly discuss instruction and program administration collectively among all stakeholders (Blase & Blase, 1999). Principals who distribute leadership across their schools contribute to sustainable improvements within the school organization (Hargreaves & Fink, 2003). Highly successful principals develop and count on the expertise of teacher leaders to improve school effectiveness (Leithwood et al., 2004). Principals need to create opportunities for teachers to work together (Mendel et al., 2002). Principals need to tap the expertise of teacher leaders in their schools in order to enhance improvement efforts and results (Marks & Printy, 2003). Principals need to function as the chief instructional leader of their school while balancing multiple responsibilities. However, to effectively foster student learning requires the exercise of distributing leadership (Tucker & Tschannen-Moran, 2002). Related Resources: Danielson, 2007; Donaldson, 2007; Dozier, 2007; Harrison & Killion, 2007; Lieberman & Friedrich, 2007; Wade & Ferriter, 2007. Today's principals must become role models for learning while continually (or at least regularly) seeking tools and ideas that foster school improvement (Lashway, 2003). Simply put, schooling is organized around two key functions: (1) teaching and learning, and (2) organizing for teaching and learning. Thus, it seems clear that school principals need to manage the structures and processes of their schools around instruction. Effective principals make student success pivotal to their work and, accordingly, pay attention to and communicate about instruction, curriculum, and student mastery of learning objectives, and are visible in the school. Learning needs to occur throughout an organization, and principals need to become participants in the learning process in order to shape and encourage the implementation of effective learning models in their schools. To illustrate, effective principals don't just arrange for professional development; rather, they participate in staff training provided to their staffs. Additionally, good principals foster the idea of working together as a valuable enterprise because they understand that this kind of collaborative learning community ultimately will build trust, collective responsibility, and a schoolwide focus on improved student learning (Prestine & Nelson, 2003). Keeping staff informed about current research and practice and possessing a belief system that schools are learning communities are crucial to school success. Principals use a variety of staff development tools to focus awareness on research-based strategies that facilitate improved instructional effectiveness (Blase & Blase, 1999). In an effort to infuse instructional know-how across the entire faculty, the concept of an instructional leader needs to become broadened beyond that of increasing student learning. Principals also need to mobilize teachers' energy and capacities. This requires a transformation of the learning cultures of schools—a capacity in which effective principals are adept (Fullan, 2002). To summarize, principals—that is, effective principals—support instructional activities and programs by modeling expected behaviors and consistently prioritizing instructional concerns day-to-day. They strive to become a learner among learners. Involvement in curriculum, instruction, and assessment are crucial to the idea of instructional leadership. As part of their ongoing instructional leadership responsibilities, effective school principals are highly visible through contact and interaction with teachers, students, and parents, thus promoting the concept of a learning community (Marzano et al., 2005). Effective principals tend to the learning of all members of a school community (Lashway, 2003). Effective principals also serve as participatory learners with their staffs (Prestine & Nelson, 2003). Successful instructional leaders provide conditions through staff development that incorporate study of professional literature and successful programs, demonstration and practice of new skills, peer coaching, and use of action research focused on student data, and they study the effect of new strategies on students (Blase & Blase, 1999). Instructional leadership requires a broader view that incorporates the expertise of teachers (Fullan, 2002). Schools that work (i.e., that are successful by various measures) have leadership that provides meaningful staff development (Marzano et al., 2005). Data sources inform and guide action, or at least they should. Without meaningful data it is impossible to monitor and evaluate the effectiveness of school initiatives. Effective principals skillfully gather information that determines how well a school organization is meeting goals and use that information to refine strategies designed to meet or extend the goals. Thus, they find themselves in a constant state of analysis, reflection, and refinement. They challenge their staff to reexamine assumptions about their work and how it can be performed. Beyond the ability to successfully gather and analyze school data, principals need to possess basic skills for using these data for setting directions, developing people, and reinventing the organization. The use of appropriate data helps to maintain a consistent focus on improving teaching and learning, and, consequently, effective principals accept no excuses for lack of success to improve student learning (Leithwood & Riehl, 2003). Many proponents of school improvement stress the importance of data-driven decision making. Today, school districts collect demographic, achievement, instructional, and perceptual data in an effort to improve teaching and learning. For example, information is gathered to diagnose student learning and to prescribe interventions that will best support students in need (Education Commission of the States, 2002). At the building level it is vital that principals employ data-gathering processes to determine staff and student needs. The demands that accompany high-stakes testing compel principals to guide their schools to learn from their results and experiences. Doing so will lead to coherence within a school and offer better opportunities to sustain results. Additionally, continuous improvement requires principals to examine data and find means to address inconsistencies with expected results (Fullan, 2005). Useful and properly mined data can inform staff about the gaps between desired outcomes and the reality of the results. Furthermore, this knowledge should result in changes in practice. Encouraging staff to collect, analyze, and determine appropriate actions based upon the results should be a collective enterprise. When staff members assume an active role in the data analysis process, it promotes solutions and actions for improving results (Zmuda et al., 2004), and facilitating the active involvement of all staff in information gathering and analysis is the prerogative of the principal. Effective school leaders skillfully gather data and use them to determine school effectiveness (Leithwood & Riehl, 2003). Continuous improvement requires an examination of the data (Fullan, 2005). Greater results are achieved when principals encourage school staff to actively analyze data for improving results (Zmuda et al., 2004). Related Resources: Brimijoin, Marquisse, & Tomlinson, 2003; Guskey, 2003; Marzano, 2003; Parsons, 2003; Schmoker, 2003. There are good reasons to focus on school leadership. The importance of the principal's role has never been greater, taking into consideration national accountability standards for schools and the likelihood that principal job vacancies will increase in the near future. Not only do effective principals focus attention on curriculum and teaching, they also understand teaching and possess credibility in the eyes of their staff (Mazzeo, 2003). Schmoker (2006) suggested that too often school cultures discourage close scrutiny of instruction. He says that effective leaders can raise the level of importance by looking for evidence that curriculum standards are taught through the review of formative assessments, grade books, team lesson logs, and student work. Principals support instructional activities and programs by modeling expected behaviors, participating in staff development (as noted earlier), and consistently prioritizing instructional concerns on a day-to-day basis. They strive to protect instructional time by removing issues that would detract teachers from their instructional responsibilities (Marzano et al., 2005). Moreover, principals in effective schools are involved in instruction and work to provide resources that keep teachers focused on student achievement. They are knowledgeable about curriculum and instruction and promote teacher reflection about instruction and its effect on student achievement (Cotton, 2003). Principals build trust by supporting and nurturing teacher development by providing feedback that helps teachers to improve. This is more likely to occur when principals exercise the collegiality of leadership. Additionally, principals are in the best position to help teachers improve in areas of weakness and can accomplish this through observations and dialogue that shows respect for teachers as professionals (Cooper, Ehrensal, & Bromme, 2005). Ultimately, many principals spend too little time in classrooms or analyzing instruction with teachers. It is important to evaluate the quality of teaching in order to select and retain good teachers, which is discussed in more depth in Chapter 3. Principals must develop leadership skills that help them to build the intellectual capital that is necessary to make good curriculum choices, establish expectations for student work, and provide teachers with opportunities to learn the specifics of teaching well within their academic areas. As such, leadership skills and knowledge of instruction must be tied together (Fink & Resnick, 2001). Effective principals possess knowledge of the curriculum and good instructional practices (Cotton, 2003) and, subsequently, focus their attention in their schools on curriculum and instruction (Mazzeo, 2003). Effective principals monitor the implementation of curriculum standards and make sure they are taught (Schmoker, 2006). Effective principals model behaviors that they expect of school staff (Marzano et al., 2005). Principals are in a good position to support teacher effectiveness through observations and conversations with teachers (Cooper et al., 2005). Principals need to spend time in classrooms in order to effectively monitor and encourage curriculum implementation and quality instructional practices (Fink & Resnick, 2001; Pajak & McAfee, 1992; Ruebling et al., 2004). Teachers and principals feel it is important to have someone to steer the curriculum and prioritize staff development (Portin et al., 2003). Teachers too frequently view classroom observations as a means to satisfy contractual obligations rather than as a vehicle for improvement and professional growth (Cooper et al., 2005). In effective schools, principals are able to judge the quality of teaching and share a deep knowledge of instruction with teachers (Fink & Resnick, 2001). An effective leader promotes coherence in the instructional program where teachers and students follow a common curriculum framework (Leithwood & Riehl, 2003). Effective principals trust teachers to implement instruction effectively, but they also monitor instruction with frequent classroom visits to verify the results (Portin et al., 2003). Related Resources: Armstrong, 2007; Wise, 2001. Nothing in the principal's role is more important for ensuring successful student learning than effective instructional leadership. School principals who focus on a vision for their schools nurture the leadership capabilities of their teachers. Additionally, if their schools are moving in the right direction, they model effective leading and learning. Combining these efforts with using data appropriately, as well as monitoring what takes place at the classroom level, will increase the likelihood that schools will achieve their goals for student learning. Copyright © 2008 by Association for Supervision and Curriculum Development. All rights reserved. No part of this publication—including the drawings, graphs, illustrations, or chapters, except for brief quotations in critical reviews or articles—may be reproduced or transmitted in any form or by any means, electronic or mechanical, including photocopy, recording, or any information storage and retrieval system, without permission from ASCD.